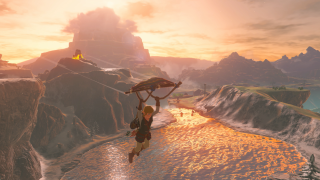 Breath of the Wild is a big game, and breaks with Zelda tradition in many ways including having voiced NPCs and a completely non-linear open world. But perhaps one of the most striking differences in the early portion of the game we played was the amount of weapons at your disposal, and the fact that they end up breaking very quickly. This stands in contrast to previous Zelda games where you would collect just one or two weapons throughout the course of the game. Having to manage an inventory is no bad thing – countless other games have included it as a feature to great effect – but Breath of the Wild’s inventory feels like it was designed to be managed with the Wii U’s gamepad, and it ends up feeling a little clunky on the Switch. For all the faults of the Wii U’s gamepad (a cheap construction and poor battery life being the worst offenders) it was absolutely amazing at managing inventories. Rather than having to pause the game to switch items in a game like Wind Waker HD, the gamepad instead made it easy to switch equipped items without having to pause the action. It allowed you to do two things at once, which is perfect for a series like Zelda which involves switching between many items to solve puzzles. The Switch doesn’t have this benefit, and the situation is made worse by the way you constantly have to rearrange your inventory to throw away weapons as they break. Breath of the Wild has made progress in some areas. You can easily switch between weapons, shields, and abilities by holding a direction on the D-pad and scrolling through them with the right analogue stick. But you can't drop weapons without pausing, which is a big problem when you’ll need to constantly drop items after each encounter to ditch those that are on the point of breaking. A typical Breath of the Wild encounter hence goes as follows: You approach a group of Bokoblins and you switch to a melee weapon, and take them out with a couple of well-placed slashes. Your weapon is now damaged, so you roam the battlefield to pick up some undamaged weapons, only to discover that your inventory is full, and you need to pause the game again to drop each of your damaged items individually. We haven’t had a chance to spend any time with the Wii U version of the game, but these feel like design decisions that were made with a second-screen in mind, and that don’t feel fully at home on a single-screen console. There are a couple of caveats to these observations. First is the fact that we were playing the first few hours of the game, and that as the game progresses you’ll more than likely find weapons with a slightly longer shelf-life. Second is the size of the inventory, which in keeping with previous Zelda games is likely to be expandable via upgrades. However, in the early portions of the game be prepared to spend a lot of time pausing the action to manage your inventory. We’re hoping to spend some time with the Wii U version when it’s released to see if its Gamepad solves these issues. Check out our extensive Nintendo Switch preview. Don't forget to check out our Nintendo Switch pre-orders page too.